I’m currently working in a primarily front-end role and I haven’t needed to use much SQL other than an occasional basic SELECT statement. That said, having a baseline level of competency in SQL is important for any developer. To continue my growth, I decided to take a dive back into Structured Query Language. My goal was to get a better grip on the basics and begin to explore some more advanced concepts. This article chronicles my exploration and provides explanations and examples for utilizing some aggregate functions as well as joins and groupings. 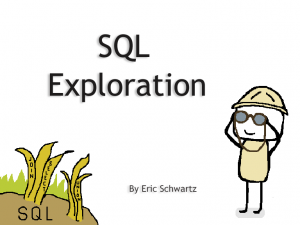 Quick note before we begin: All of the SQL written in this article is “standard ANSI” SQL and should work on any ANSI-compliant database. Different database engines (i.e., MySQL, PostgreSQL, Oracle) come with their own custom SQL functions, syntax, etc., that build on the ANSI standard, but it is usually best to stick to the standard unless you need some database-specific feature or function. First, I needed sample data. Some searching led me to this database of fake employee data. It has several tables filled with information including names, birth dates, hire dates, salaries, departments, and titles – an ideal data set to play around with. Next, I needed a simple way to write SQL statements and view the results. 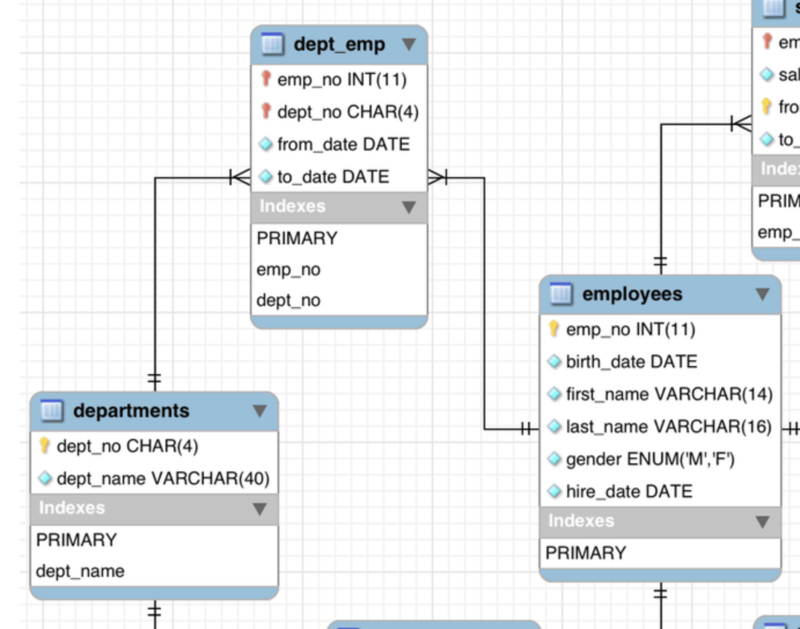 This is achieved by setting up a simple MySQL or PostgreSQL database, and using one of many free apps available for either Mac or Windows to view the schema and run queries. If you don’t feel like taking the time to set up your own database but would like to follow along, you can view the schema here and skip to the next section. 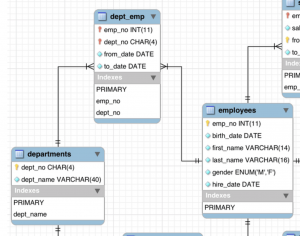 Once your database is set up, you’ll need a way to run some queries. MySQL Workbench is the official graphical user interface (GUI) tool for MySQL and will be perfect for our purposes. After it’s installed, open it up and you should see a local instance under the MySQL Connections header. Click on the instance. If prompted, enter your password. Now you should be taken to the main screen of the app. On the left sidebar, look for the SCHEMAS section, where you’ll find a list of databases (or just one database). Double click employees, and the text should turn bold. Our sample database is now ready for SQL querying! You can type your queries in the Query window. Click the lightning bolt icon to execute. Next, I’m going to go ahead and jump into some technical explanations beginning with aggregate functions. If you haven’t gotten the hang of simple SELECT / WHERE statements yet, it might make sense to get a feel for how a basic SQL query is formatted, then come back. (W3Schools is a great place to start!) Otherwise, let’s get into it. An aggregate function performs a calculation on a set of values and returns a single value. In the following section, we’ll walk through some of the most commonly used SQL aggregate functions: COUNT, SUM, MAX/MIN, and AVG. We’ll also make use of ROUND, which, although it’s not an aggregate function, will be particularly useful in conjunction with AVG. It is generally good practice to add AS [name] to the SELECT line of aggregate queries. AS is used to assign variable names to the result columns. The query above shows us that a total of 117,075 employees were born after (but not including) January 1st, 1960. Once we add joins and grouping to the mix, SUM will become more useful. Let’s come back to this one a bit later. AVG() also takes in a numeric column and returns – you guessed it – the average of the values for that column. which will return the average salary rounded to the nearest cent; $63,810.74 in our case. The primary key serves as a unique identifier for each row. It is good practice to have a primary key column on every table. The foreign key is a reference to the primary key of another table. In our case, we have an emp_no column on the titles table. This allows us to join the employees and titles tables together by matching the primary key of employees to the foreign key on titles. This key-matching occurs after the keyword, ON. Once a JOIN is introduced to a query, column names must be prefaced by their respective table names followed by a period. Now, instead of counting employees, what if we wanted to find the average salary by title? Because salaries are on their own table, we had to use another JOIN. We took the average FROM salaries, joined employees ON the salaries table, then joined titles by matching up keys with employees. Finally, we grouped by the titles.title column once again. Due to the large number of decimals in those averages, we probably could have benefited from using the ROUND function. This one is a bit more complicated than you might expect because the departments table cannot be joined on employees as they share a many-to-many relationship. An employee can belong to several departments, and each department can have many employees. With a many-to-many relationship, neither table contains a foreign key for the other. The way I think of HAVING is – it works just like WHERE, but it can only be used in conjunction with GROUP BY. Until this point, every JOIN in the examples we have used has been an INNER JOIN. (Also known as a simple join.) This is the most common type of JOIN. It returns only the rows that have matching values in both tables. There are three additional types of joins, and they could all be generally characterized as OUTER joins. In each case, the keyword OUTER is optional. The third type of outer join is a FULL OUTER JOIN. This can be written like the two above examples and simply returns all rows from both tables mentioned. Matching rows will be represented as a single row, and for rows that do not have a match, the result set will have NULL for all columns of the table without a matching row. Going through these examples helped me gain a better understanding of SQL principles, and I hope this has been helpful for you as well. If you haven’t already done so, I would encourage you to download the sample data and set it up with a GUI tool so you can practice running queries of your own. Now that I feel I have a decent grasp on some of the most common SQL functions, I plan to learn about performance tuning. I see that topic come up quite a bit on my current project, and I can imagine it being incredibly useful for future endeavors.